NextNarrative History’s Man of the Moment. Remembering Jack: A Little Over a Thousand Days In Office. Every President wants to be remembered with an amazing record in office. We call this a legacy. John F. Kennedy’s legacy differs from others and no one thought it would have such a cruel twist of fate. When we all wake up tomorrow morning, it will be the 50th Anniversary of the assassination of the 35th President of the United States of America. JFK’s assassination was before my time, but his Presidency and legacy to twentieth century history is profound. I can only imagine what it would have been like for Americans to hear the news of his death or those awaking up around the world to be equally traumatised. John Fitzgerald Kennedy was a member of one of the most influential, wealthy American families of the last century. He was a young man with a beautiful wife and four children. He was also a World War two veteran who lived in excruciating pain most of his life with a degenerative illness that was hidden from the scrutiny of the public and political office. As a Catholic he had to overcome religious intolerance before he was elected in one of the closest presidential elections of the twentieth century. Kennedy as the newly elected President in 1961, together with his team brought a new style to public office. They shunned the past and focused on rebuilding the United States into a “superpower” through ingenious innovation and strategic long term planning. He hoped to do this through his great communicative skills. He particularly used the power or use of television to help him “sell” his grand vision. High on Kennedy’s agenda was restoring national pride, visions of social justice and democratic freedom worldwide. His social programmes included federal aid for education, increases in the minimum wage and social security benefits and medical care for the ageing generation. However, in civil rights, he was initially hesitant and unassertive in pushing for serious change. The activities of the “Freedom Riders”, in particular, was a failure of his presidency. He insisted on a “cooling off period” between civil rights activists and the Southern States. He condemned the Rides as unpatriotic because they were embarrassing to the nation. World outrage of the inaction of the Federal Government and the mass demonstrations led by Martin Luther King eventually forced Kennedy to act. He had also many other failures or faults, many of them personal, which included his infidelity and appetite for female “conquest”. Though, his most public failure was the Cuban invasion, the Bay of Pigs, which forever stained his presidency. Putting aside many of these shortcomings, he was otherwise strong and attentive when it came to greater matters of diplomacy and defence. It is in his decision to staring down Russian leader Nikita Khrushchev over the Cuban Missile Crisis that elevated him to greatness. The world has Kennedy to thank for possibly averting global nuclear destruction ? With notions of Camelot and grandeur suurounding Kennedy (more so after his death), no one can look past the fact that the boldest promise or prediction he ever made came true. 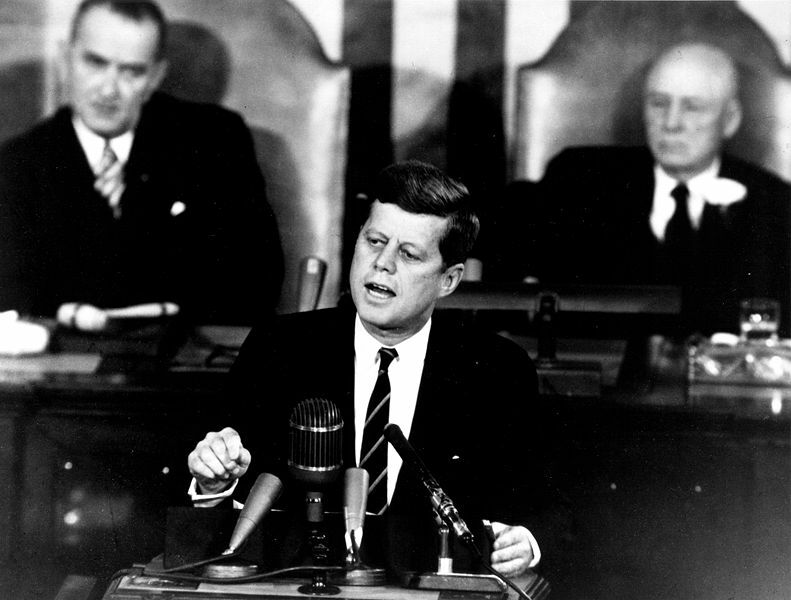 In May 1961, Kennedy declared that “this Nation should commit itself to achieving the goal, before this decade is out, of landing a man on the Moon”. Sure enough, this was achieved in 1969, six years after his death. His assassination on November 22nd 1963, will forever be remembered. As stated earlier, it not only shook America but the entire world. However, one might wonder, if he had lived, would his reputation have been different or even diminished with time? Some people today still ask, “Is he the greatest President of the United States?” This is for others to judge in time, maybe even in another fifty years? Though what we can say about him is that no one can ever doubt his rhetoric, his confidence or his abilities in lifting his countries hopes and dreams. JFK declaring his ambitions to put a man on the Moon in May 1961. Thank you for a very beautiful post about JFK. I was raised on the Kennedys. My mother immigranted from Ireland just a few years before he was elected and without being blind to their faults, the Kennedys were America’s Royalty to my mom and our family. Everyone can say where they were when they heard of JFK’s assassination. My mom was giving my two older brothers their bath and my aunt went in to tell her. Five days later just before Thanksgiving she gave birth to her first daughter, me. Beautiful story Maryanne.Yes, JFK is still an inspiration to many people.There is a lot to like about him even though he had many great faults and demons. My wife and I actually share our 16th Wedding Anniversary with JFK on the 22nd. It didn’t even cross our minds all those years ago. In 1966, while flying DUSTOFF medevac helicopters in Dominican Republic, I met several Army Special Forces Bay of Pigs Invasion survivors (some Cuban-American) who were deployed at a covert location in the mountains. They would relate, in tears, their memories of the loss of their many comrades who were slaughtered by enemy defenders on the beaches of Cuba during the Bay of Pigs invasion when Kennedy halted air support for their U S planned amphibious invasion that had been launched. More than 2000 Cuban exiles were captured and over 100 killed. Narrative History’s Man of the Moment.